Here is an easy way to make improve valve adjustments on a GMC ( all 228 thru 302 had solid lifters ). Go to an old truck wrecking yard with a 7/16″ wrench and find a salvage GMC 305 V6 engine. Remove the 12 valve adjusters. Note that these adjusters do not use locknuts – the threads are an interference fit. Remove your original rocker stand, and spot-weld each rocker arm on the parting line, next to where the adjuster screws in. Be careful not to get any weld into the threads. The reason for doing this is that the new adjusters can spread the stamping out and cause the valve adjustment to go off . Then, run a tap down the threads to clean them up. Replace the old lock nut style adjusters with the V6 adjusters. You may find, as I did on my 302, that with all threads engaged, you have to change to a shorter pushrod – I used pushrods from a Chevy 235. They measure about 11-3/8″ long. The result of all this is that you eliminate the locknuts and make valve adjustments easier. 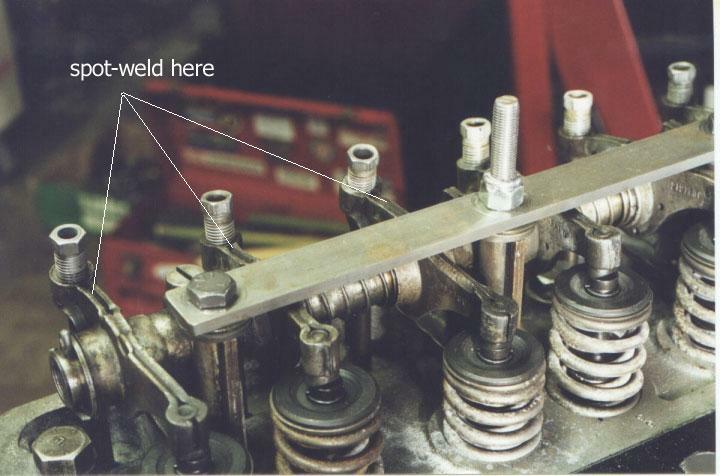 The picture below shows the new adjusters and where to weld the rockers. This valvetrain also has stabilizer bars to eliminate rocker flex, but that’s another story.